The church of St Mary and All Saints at Whalley, next to, but pre-dating the Abbey has a Mitton chapel that belonged to the Mitton manor according to Dr. T.D. 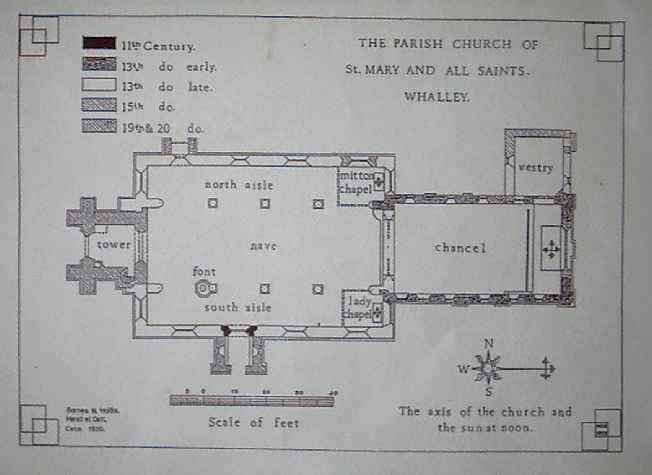 Whitaker in his book The History of the Parish of Whalley, which includes the layout of the church and the location of the Mitton Chapel originally on the left side of the chancel. (please click diagram to enlarge). The Mitton chapel was originally for the use of the Catterall family and later the Shireburnes of Little Mitton Hall. In the Little Mitton Chantry there are two bench ends, each perforated at the head in the form of a cross-raised upon three steps (a cross cavalry), and having a panel of arms below with the date 1638. One shield presents the arms and initials of Francis Paslew of Wiswall; the other, without initials Quarterly, an eagle displayed and a lion rampant, the arms of Shireburne. The above is the Catterall brass representing the Catteral family of Little Mitton Hall. It can be seen on the wall of St Mary’s at Whalley. The brass plate is proximate to the Mitton Chapel inside the church. The Catteralls married into the Mitton family on a least two occasions. The Mitton chapel was for the use of the Catteralls, and later the Shireburnes, of Little Mitton Hall. The fourth daughter of Ralph Catterall, Jane, married Thomas Shireburne and would be represented as one of the daughters in the above. The chapel was used as a chantry chapel for Mass for the soul of King Henry VI until the Reformation. The glass on the left of Mitton Chapel below is the only reference to King Arthur in any church or chapel in England. The tomb contains and unknown person.